The Legislature should reauthorize the Medicaid Fraud False Claims Act because it allows the state to pursue additional fraud cases, and recoveries have increased. Medicaid is a joint federal-state program that pays health care providers for services to eligible individuals and families. In some instances, providers file false claims, billing for services not provided or other fraudulent schemes to obtain payment to which they are not entitled. One way Washington combats Medicaid fraud is through civil cases brought by the Attorney General and private individuals acting as whistleblowers under the authority of the state’s Medicaid Fraud False Claims Act (FCA). This act complements state criminal and federal Medicaid Fraud investigations. Washington’s FCA terminates June 30, 2016, unless reauthorized by the Legislature. Medicaid fraud recoveries have increased since the Act was enacted in 2012. In addition, JLARC staff did not find evidence that private individuals have brought frivolous cases against Medicaid providers under the Act. The Office of the Attorney General concurs with this recommendation. Medicaid provides health coverage to 1.75 million Washingtonians, including eligible adults, children, pregnant women, elderly adults, and people with disabilities. Medicaid is administered by states, according to federal requirements. The program is funded jointly by states and the federal government. Fiscal Year 2014 expenditures for Washington’s Medicaid program totaled $9.6 billion. The state’s share of those expenditures was $4.0 billion, or 42 percent. Knowingly misrepresenting or concealing material facts. As a joint federal-state program, three avenues are available to investigate potential Medicaid fraud: federal investigations, state criminal investigations, and state civil investigations. The authority for state civil investigations sunsets in 2016 unless the Legislature acts. 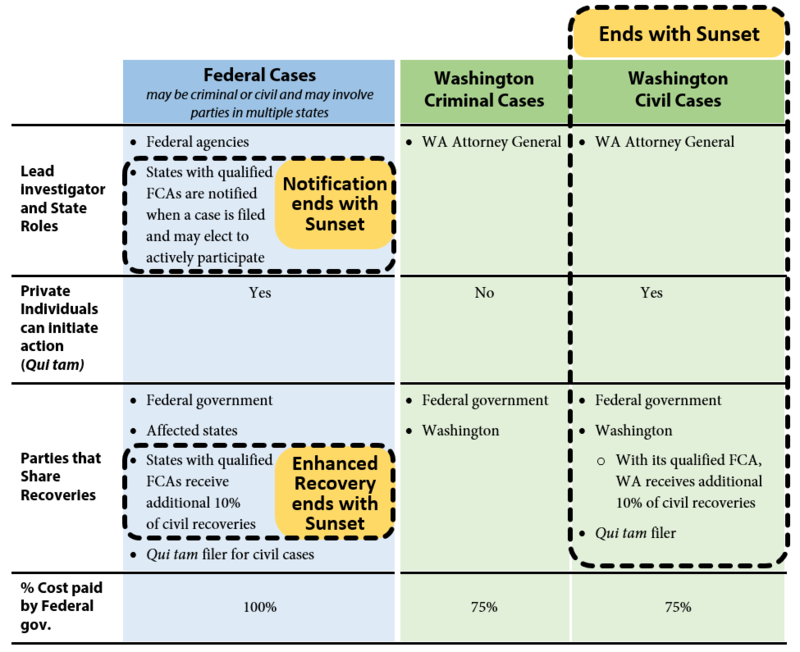 Exhibit 1 below provides a graphic overview of the three avenues and illustrates what authority will remain and what authority terminates if Washington’s Medicaid Fraud False Claims Act (FCA) sunsets. Recoveries obtained as a result of these investigations are shared between the state and federal governments in proportion to each government’s share of Medicaid funding. Source: JLARC staff review of federal and Washington Medicaid fraud statutes. The federal government may initiate investigations under federal criminal law or the federal False Claims Act. The federal False Claims Act also allows private individuals (for example, whistleblowers) to initiate cases on behalf of the government and share in a portion of any financial recoveries. These are known as qui tam cases. Where cases involve multiple states, federal investigators may request assistance from states that have enacted false claims statutes that mirror the federal False Claims Act. The federal act has no termination date and will be in effect whether or not Washington reauthorizes its FCA. Washington has had a Medicaid Fraud Control Unit since 1978. The unit has been housed in the Attorney General’s Office (AGO) since 1982 and is funded by a 75 percent-25 percent federal-state match. The AGO investigates criminal cases involving Medicaid fraud. The state authority to investigate cases of Medicaid criminal fraud is not part of Washington’s FCA and will not terminate in 2016. The Legislature enacted Washington’s Medicaid Fraud False Claims Act in 2012 (ESSB 5978). Washington’s False Claims Act expanded the AGO’s authority to include civil investigations of Medicaid fraud. This authority expires June 30, 2016. To staff this effort the AGO added a Civil Section to the Medicaid Fraud Control Unit in 2012. The Civil Section is currently staffed with four attorneys, five investigator/analysts, one financial examiner, and two paralegals. The federal government funds 75 percent of the Civil Section’s expenditures, and Washington funds the remaining 25 percent. Similar to the federal False Claims Act, Washington’s FCA also authorizes private individuals to bring qui tam cases on behalf of the state. In addition to penalties established in Washington’s FCA, ESSB 5978 also amended RCW 74.09.210 to authorize the Attorney General to assess civil penalties up to three times the amount of any payments obtained through fraudulent means. This provision is separate from the Medicaid Fraud False Claims Act, and not subject to sunset termination. Medicaid fraud recoveries have increased, providing funding for Medicaid services, fraud detection and prevention, and other Medicaid fraud enforcement activities. Since 2012, the Attorney General has investigated 29 in-state civil cases of Medicaid fraud under the authority of Washington’s FCA. The AGO would not have been able to pursue these fraud cases absent the Act. Civil case investigations may arise from a variety of sources such as AGO investigations, referrals from the AGO’s Medicaid fraud criminal section, the Washington Health Care Authority (which manages the state’s Medicaid program), qui tam filings, tips from the public, and newspaper articles. Because Washington’s FCA is consistent with the federal FCA, the AGO receives early notification and may participate actively in federal qui tam cases involving Washington providers. According to the AGO staff, this early notification allows state fraud investigators to identify what state interests are affected by a case and determine how actively the state may wish to participate in a case to increase state recoveries. AGO staff report serving on 57 national case teams for intake, investigations, settlement, or litigation. $6.1 million of the increased fraud recoveries is directly attributable to cases the AGO pursued under the state FCA. Washington’s share of this amount was $2.8 million. The figures above include penalties and interest. Funds recovered through Medicaid fraud investigations are shared between the state and the governments in proportion to each government’s share of Medicaid funding. Where applicable, a portion of recoveries may also be shared with private individuals who initiate cases under Washington’s FCA. Since 2012, Washington has been eligible to receive an additional 10 percent of recoveries since Washington’s law is fully compliant with the federal FCA. As shown in Exhibit 2, in the three years since the state’s FCA took effect, total average annual civil recoveries increased by 28 percent over the preceding 3.5 years. Portions of this increase are the direct result of civil cases opened by the AGO. Source: JLARC staff analysis of AGO civil fraud recovery data. 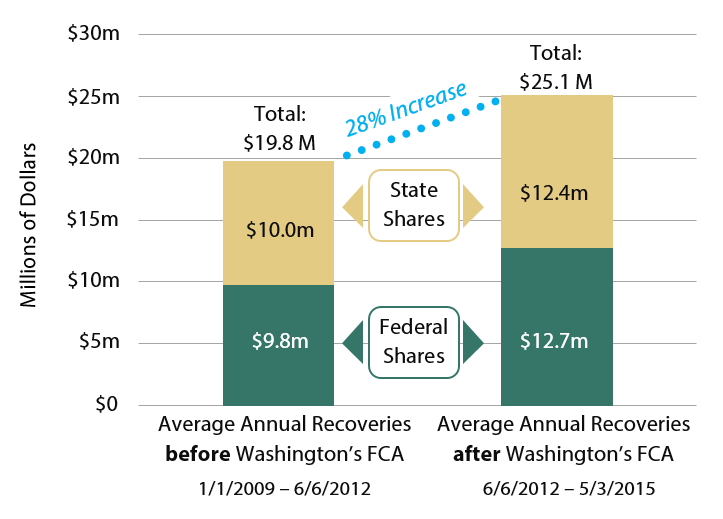 The $2.8 million state share of total recoveries resulting from cases initiated under Washington’s FCA authority since 2012 represents the clearest impact of the Act’s financial benefit to the state. This amount is exclusive to Washington and would not have been recovered in the absence of Washington’s FCA. During the three years since the Act’s passage, Washington’s share of expenditures for all Medicaid fraud civil cases was $963,000, or a return on investment of $2.96 for every state dollar spent. Washington’s share of Medicaid recoveries are deposited into the Medicaid Fraud Penalty Account. By law, funds from this account may be spent only after appropriation to fund Medicaid services, fraud detection and prevention activities, recovery of improper payments, and other Medicaid enforcement activities. Washington’s Medicaid Fraud False Claims Act (FCA) allows private individuals to file civil fraud complaints against Medicaid providers. This provision mirrors a similar provision in the federal FCA and is one of the necessary elements for demonstrating compliance with federal requirements. Qui tam cases enable an individual—typically an employee—with knowledge of the provider’s operation to initiate a case and receive a share of the recovery. According to a 2007 Columbia Law Review article, qui tam cases are considered essential to identifying many types of complex medical fraud that might escape detection through routine oversight activities. When the individual, known as a “relator,” files a qui tam case, the individual must serve a copy of the complaint and supporting information on the Attorney General and file the complaint with the appropriate court. The court must keep the complaint under seal (secret) for a minimum of 60 days. The Attorney General has these 60 days (and may request extensions) to decide either to intervene in the case or decline to intervene. The complaint is not served on the health care provider while the case is sealed and the AGO reviews it. If the Attorney General declines the case, the relator may continue to pursue the case on his or her own. The AGO staff report four qui tam cases citing only Washington’s law filed between June 2012, when Washington’s FCA took effect, and May 31, 2015. For two of these cases, the AGO has not yet made a determination on whether to intervene. The outcomes of the other two cases are described below. Washington Case 1: Allegations of poor quality of care and kickbacks – Case settled. This case did not begin as a qui tam case. The case originated as a criminal case section which investigated information alleging poor quality of care and kickbacks. The information was provided by two employees of a Washington provider. The Civil Section opened the case in June 2013, conducted five depositions, obtained payment records, and contracted with an expert witness to analyze the payment records. The AGO made a settlement offer to the provider’s counsel in May 2014. While settlement negotiations were in progress, one of the two original sources filed a qui tam complaint in this matter in Superior Court. The final settlement was completed in January 2015 and addressed both the original case and the qui tam case. The total recovery was $3.65 million. The qui tam relator received $292,000. Washington’s share of the recovery was $1.64 million, including a 10 percent increase due to the state FCA conformance to the federal FCA. Washington Case 2. Allegations of improper payments – Case dismissed. A qui tam relator filed this case in state court alleging a kickback scheme between a provider and a specialty provider. The AGO began its review in July 2012. The investigation lasted four months and determined that the payments fell under an exception for payments by employer to a physician and did not constitute a false claims action. The AGO filed a motion to decline to intervene in November 2012. The relator voluntarily withdrew the complaint, and the court dismissed the case in February 2013. The court did not dismiss the case as frivolous. Washington Cases 3 and 4: A decision to decline or intervene in these cases was pending as of May 31, 2015. Details remain confidential at this time. The AGO staff identified one qui tam case in the relevant period where a relator raised the same complaint in both state court and federal court. The AGO also identified one case filed in federal court where the relator cited both the Washington and the federal false claims acts. The AGO had not made a determination on whether to intervene in this case. The third case cited only federal law but the US attorney requested that Washington investigate. This ultimately resulted in Washington intervening in this case along with the federal government and 10 other states. The concerns raised in these cases would have been investigated regardless of whether Washington retains its FCA. However, by enacting a state FCA that is consistent with the False Claims Act, Washington receives early notice of and has the opportunity to actively participate in federal cases. Federal/Washington Case 1: Allegations of improper billing – Case dismissed. A qui tam relator filed this case as two separate actions in both state and federal courts in August 2013. The complaint alleged a provider was billing both patients and Medicaid for the same services. The AGO obtained patient billing records, relator’s filings, and the federal case file. The investigation identified 15 patients who may have been improperly billed. The provider’s attorneys and compliance staff demonstrated to AGO staff that the billings were not inappropriate and were largely due to the complexity of verifying patients’ Medicaid eligibility. The federal court dismissed the federal FCA action in August 2014. The AGO filed a motion to decline to intervene in the state case in September 2014. The relator voluntarily withdrew the complaint, and the court dismissed the case in March 2015. The court did not dismiss the case as frivolous. Federal/Washington Case 2: Allegations of improper billing – Case settled. This case involved a Washington provider and was filed in federal court under the federal False Claims Act. The relator alleged that the provider had billed for services or supplies not provided. The US Attorney’s Office investigated the case. Because the complaint did not reference Washington’s FCA, the AGO had limited involvement in the case until the US Attorney requested that Washington join in the settlement negotiations in April 2013. The case was settled in June 2013 for $8,953, of which Washington received $4,774. The relator did not receive a share of this recovery. Federal/Washington Case 3: A decision to decline or intervene in this cases was pending as of May 31, 2015. Details remain confidential at this time. When the Legislature was considering the legislation to create a Washington False Claims Act, representatives from the state hospital and medical associations, along with other parties, expressed concerns that the proposed qui tam provisions would lead to numerous frivolous lawsuits, significantly burdening providers. RCW 74.66.060(2)(d) allows the court to limit the relator’s participation in litigating a case when the defendant shows that the relator’s participation would be for purposes of harassment or would cause the defendant undue burden or unnecessary expense. JLARC staff contacted representatives of the Washington State Hospital Association, Washington State Medical Association, the Washington Trial Lawyers Defense Association, and the Washington Liability Reform Coalition and asked if they are aware of financial and other adverse impacts that Washington’s qui tam provision has had on Medicaid providers. None of the parties provided examples of inappropriate costs incurred from qui tam cases filed under Washington’s FCA. No court has dismissed a qui tam case brought under Washington’s FCA as frivolous. Early notice of federal qui tam actions involving state Medicaid providers when the case is filed. This notice provides state investigators with the opportunity to actively participate in the case during its preliminary stages when the matter remains confidential under court order. An additional 10 percent increase in the state share of any recoveries obtained through the state false claims statute. Having state law include qui tam provisions is a central requirement for obtaining federal approval of a state FCA. If Washington terminates the qui tam provision of its FCA, the state would no longer be eligible for either incentive. Absent a Washington FCA, providers would continue to be subject to federal qui tam actions. Question 1: Has use of the Medicaid Fraud False Claims Act complied with legislative intent? Yes. The Attorney General’s Office (AGO) has investigated allegations of Medicaid fraud and increased annual recoveries since Washington’s FCA went into effect in June 2012. In addition, AGO has complied with the procedural requirements established by the Legislature in Chapter 74.66 RCW. Question 2: Does the Act provide for efficient and economical fraud investigations, with adequate cost controls in place? Yes. The AGO uses case management software to monitor cases and ensure that filing deadlines are met. During the three years since the FCA went into effect, the AGO has recovered $2.96 for Washington’s Medicare program for each state dollar expended. Question 3: Has the Act achieved expected performance goals and targets? Yes. The Act authorizes the Attorney General to pursue civil actions against Medicaid providers who submit fraudulent claims. Prior to passage of the state False Claims Act, Washington lacked this authority for civil action against Medicaid fraud. In the three years since the Act became law, the AGO has opened 29 in-state civil cases. Settlements in these cases account for $6.1 million of the total $6.5 million increase in civil recoveries since 2012. In addition to the monetary recoveries, the AGO reports that it has entered into corporate integrity agreements, consent decrees, or injunctions that establish ongoing requirements for the providers' continued participation in the Medicaid program. These agreements, decrees, and injunctions are enforceable in Washington and are intended to eliminate industry activities, practices, or business models that facilitate Medicaid fraud. Question 4: To what extent does the Act duplicate the activities of another agency or the private sector? None. Although the federal government and Washington Health Care Authority (HCA) have functions similar to the Attorney General’s role in investigating Medicaid fraud, these organizations’ efforts complement rather than duplicate each other. At the state level, HCA investigates improper Medicaid payments. Its role is to investigate and recover payments that were made improperly due to its own errors or provider errors that do not rise to the level of a false claim. The Attorney General investigates improper payments that appear to be the result of fraud, knowingly submitted by a provider. The two organizations have established a memorandum of agreement to coordinate their activities. In addition to the Attorney General and HCA, the National Association of Medicaid Fraud Control Units coordinates multi-state Medicaid fraud investigations, settlements, and litigation under the qui tam states’ false claims acts and the federal False Claims Act. Although Washington providers may be subject to a multi-state investigation, these investigations do not duplicate the Attorney General’s work. In fact, AGO now receives early notice of these cases and has the option to actively participate in them if it determines that participation serves the state’s interest. Note: JLARC also requested a response from the Office of Financial Management (OFM). OFM responded that they did not have comments on this report. Both the Office of the Attorney General and the Office of Financial Management (OFM) were given an opportunity to comment on this report. Here is a link to the response from the Office of the Attorney General. OFM responded that they did not have comments on this report. On December 16, 2015 this report was approved for distribution by the Joint Legislative Audit and Review Committee. Why a JLARC Sunset Review of the Medicaid Fraud False Claims Act? Washington participates in the federal Medicaid program which pays health care providers for services to eligible low income individuals and families. In some instances providers file false claims, billing for services not provided and other fraud schemes. In 2012, the Legislature passed the Medicaid Fraud False Claims Act (Act), with the intent to “provide this state with another tool to combat Medicaid fraud.” Modeled on similar federal legislation, the Act’s purpose is to “…root out significant areas of fraud” and help recover state money that could be used to support the state’s Medicaid program. The Act includes a sunset review provision which terminates the authority to pursue potential fraud under the Act after June 30, 2016, unless reauthorized by the Legislature. The Legislature assigned responsibility for investigating potential Medicaid fraud to the Medicaid Fraud Control Unit within the Attorney General’s Office (AGO). The unit is responsible for investigating and prosecuting civil and criminal healthcare provider fraud against Washington’s Medicaid program. Between June 2012, when the Act took effect and January 2015, AGO reports that the unit’s expenditures totaled $3.2 million, of which 75 percent was funded by the federal government. Reported recoveries during that period were $76 million, primarily the result of 149 federal false claims actions which named Washington providers. That amount was divided almost equally between the state and federal governments. A key element of the Act is the “qui tam” provision, which allows private individuals known as “relators” to bring a false claim action against a provider. The Attorney General’s Office receives notice when qui tam actions are initiated, and the Act gives the office the option to prosecute or decline qui tam cases brought under the Act. If the AGO initially declines to pursue a qui tam case, the relator may continue to pursue the case, although the Attorney General may intervene at a later date or seek to have the case dismissed upon showing good cause. Relators can receive up to 30 percent of recoveries depending on their involvement in bringing and litigating the case. Since the Act became law in 2012, Washington relators have filed three qui tam Washington-only actions under the Act’s authority. Two other Washington-only qui tam cases were filed under both state and federal law. In addition, several multistate and federal cases citing the Washington Medicaid Fraud False Claims Act have been filed in federal courts around the country. What Is a Sunset Review? The Washington Sunset Act (Chapter 43.131 RCW) establishes the process for conducting sunset reviews. When a program is subject to sunset, the program terminates unless the Legislature reauthorizes the program. In the year prior to the termination date, the Joint Legislative Audit and Review Committee (JLARC) staff review the extent to which the program has complied with legislative intent and whether the program has met its performance targets. The Legislature included a June 30, 2016, sunset date for the Medicaid Fraud False Claims Act. JLARC staff will complete a sunset review of the use of the Act prior to the 2016 Legislative Session. To what extent has use of the Medicaid Fraud False Claims Act complied with legislative intent? To what extent does the Act provide for efficient and economical oversight of Medicaid providers, with adequate cost controls in place? To what extent have actions pursuant to the Act achieved expected performance goals and targets? To what extent does the Act duplicate the activities of another agency or the private sector? The review will include a recommendation of whether to terminate, modify, or continue without modification the Medicaid Fraud False Claims Act. Staff will present the preliminary report in September 2015 and a proposed final report in December 2015.